Anatomy is the branch of biology that deals with the study of the shape and structure of different body parts in organisms. Concerning the stomach anatomy, it consists of four muscular layers, namely mucosa, sub-mucosa, muscularis externa and serosa. Mucosa is the main layer containing glands which are responsible for secreting enzymes, hydrochloric acid and mucus—all to aid in the digestion of food.The outermost layer of muscularis externa is called the longitudinal layer. Lying next to it is the middle circular layer. Finally, the innermost layer is called the oblique layer. The classical model of stomach anatomy suggests that the organ has four distinguishable sections, namely, cardia, fundus, corpus and pylorus. Each of these partshas specific cell types which are assigned a specific role to play in the process of digestion. Let’s have a look on each of the four regions of stomach, while highlighting the composition, placement and functioning of each. 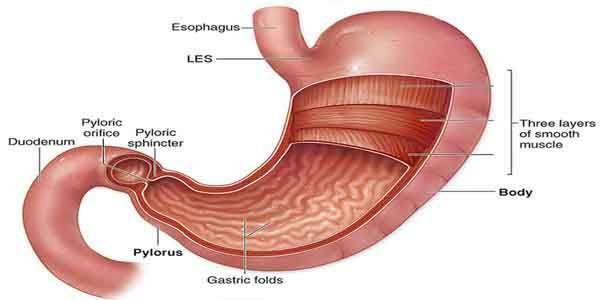 This is the first region of the stomach which lies immediately next to lower end the esophagus. Cardia begins at the termination point of gastroesophageal sphincter. Here you can see that the stratified squamous structure of epithelium undergoes transformation into columnar layout. The masticated food, coming from mouth, enters the cardia while leaving the esophagus or food gut through the lower esophageal sphincter. In the anatomy of stomach, it is the uppermost portion, forming the upper curvature of the organ. When chemical digestion takes place in the stomach, stomach gases are produced. These gases are accumulated in the fundus. Moreover, it can also store undigested food for about an hour. The word ‘corpus’ has been derived from Latin, and refers to the body or major part of something. This is the main region of the stomach which lies in the center of the organ. This is where the chemical digestion of food takes place. Enzymes and acidic secretions assist in the digestion of food, especially the protein constituents. The pylorus connects the stomach to the small intestine. This is where the digested food collects before it enters the small intestine through the pyloric sphincter. With the facilitation of this lowermost section of stomach, the churned and partly digested food is emptied into the small intestine for further digestion and absorption. As the very name suggests, this is the mucus secreting layer that lines the interior of the stomach. Measuring about 1 mm in thickness, it contains the gastric pits and glands and has a soft, smooth and velvety surface. While moving from cardiac to the pyloric end, the thickness of gastric mucosa goes on increasing gradually. Looking at its anatomical structure, you will find it further composed of muscularis mucosae, lamina propria and epithelium. The presence of the ducts of gastric glands renders its inner surface a honeycomb appearance. Coming next to mucosa, there is a layer of loose connective tissues, called submucosa. Besides providing mechanical support, the submucosal layer also connects mucosa to the smooth muscle layer. While going towards the mucus membrane, the nerves and vessels (including blood vessels) pass through this layer of stomach. Lying beneath the submucosa, this particular layer of stomach can be further divided into three layers, which are: outer longitudinal layer, middle circular layer and inner oblique layer. The inner oblique layer assists in churning and physical breakdown of the dietary constituents. The middle circular layer has a role in the formation of pyloric sphincter at the lower end of stomach, which regulates the passage of chyme from stomach into the small intestine. Serosa or serous membrane is made up of two layers of epithelial cells, called visceral membrane and parietal layer. A lubricating fluid, produced by serosa, is used to decrease friction caused by different layers of muscles moving against each other. The covering of heart, called pericardium, is actually of the nature of serosa membrane. The secretions, like mucus, gastric acid, enzymes and hormones are the product of different gland cells found in the wall of stomach. Also known as delomorphous or oxyntic cells, these cellular structures are found in the epithelium of stomach. The parietal cells are responsible for the secretion of two important substances, namely hydrochloric acid (HCL) and intrinsic factor. You can locate these cells only in the fundic region of the stomach. Located in the fundic, cardiac as well as pyloric regions of the stomach, these are the mucus secreting cells. The mucus, thus secreted, forms a gel-like layer to the interior of the stomach which serves as a protection against the corrosive effect of strong gastric acid. Depending on their placement in the stomach, foveolar cells can also be termed as mucus neck cells or surface mucous cells. Such mucus producing cells are also found in the intestine, but you can easily differentiate between faveolar cells and goblet cells (in the intestine) on the basis of their histology. Just like their mucus-secreting counterparts (i.e. faveolar cells), these are also found in three different regions of the stomach, namely, cardiac, pyloric and fundic. These are considered very important because of their ability to secrete various kinds of peptides or gastrointestinal hormones. Playing the role of chemoreceptors, the enteroendocrine cells cause the initiation of digestive processes. They have also been seen as identifying harmful substances in the food and triggering protective responses. Also termed as gastric zymogenic or peptic cells, the gastric chiefcells are present only in the deep mucosal layer of the fundic region of your stomach. Stimulated by the acidic condition in the stomach and certain other factors, these cells release pepsin enzyme in its inactive form, called pepsinogen, which then carries out the digestion of proteins. The secretion of gastric lipase, on the other hand, allows for the chemical breakdown of lipids present in the food. With the help of various anatomical structures, your stomach plays a vital role in the digestion of food. After getting masticated in the mouth cavity, the food bolus is passed on to stomach via esophagus. In this elastic pouch, the dietary particles are subject to gastric digestion. The coordinated movements of the stomach wall muscles assists in physical breakdown of food, while chemical breakdown is accomplished by the acidic and enzymatic secretions. Having passed through the process of gastric digestion, food material assumes the shape of chyme, which is then transferred to the small intestine via pyloric sphincter for further breakdown and ultimate absorption into the blood stream.